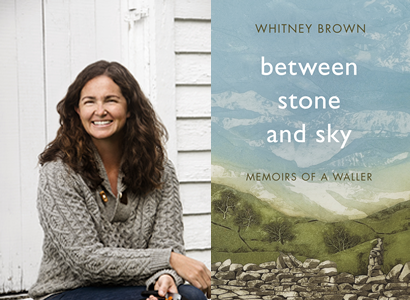 Join us for an evening with Whitney Brown as she talks about her memoir Between Stone & Sky: Memoirs of A Waller. At the age of twenty-six, Whitney Brown was midway through her Masters thesis and on track for an exciting position at the Smithsonian Institute in Washington when a chance meeting with a Welsh dry-stone waller at a Festival changed the course of her life. Within weeks she was out on the hill with him in Wales, learning the language of dry-stone walling. Far away from the pressures of her old life, she found deep satisfaction in working with her hands, in the age and heft of the stones, and the ring of the hammer. Out under the open sky, Whitney relished every sore muscle and smashed finger, opportunity to stand atop a wall she’d just built and feel like the strongest woman alive. Between Stone and Sky is a celebration of the raw and rugged splendour of the Welsh countryside and the enduring beauty and relevance of traditional craftsmanship. It is an unflinchingly honest account of the emotional struggle to become and belong. Most of all, it is an empowering story of female friendship, accepting uncertainty and risk, and crossing oceans in pursuit of dreams. We’re delighted to be hosting this event with Whitney as part of our ‘Great Outdoors’ season of events. Tickets: £6 (£5 redeemable against a signed copy of Between Stone and Sky). Includes a glass of wine / soft drink on arrival. Tickets available from the bookshop, or purchase online (with booking fee).